This particular morning, myself and 4 of my children hiked in the dark up to Dream Lake in RMNP for what I had hoped would be a glorious sunsrise. 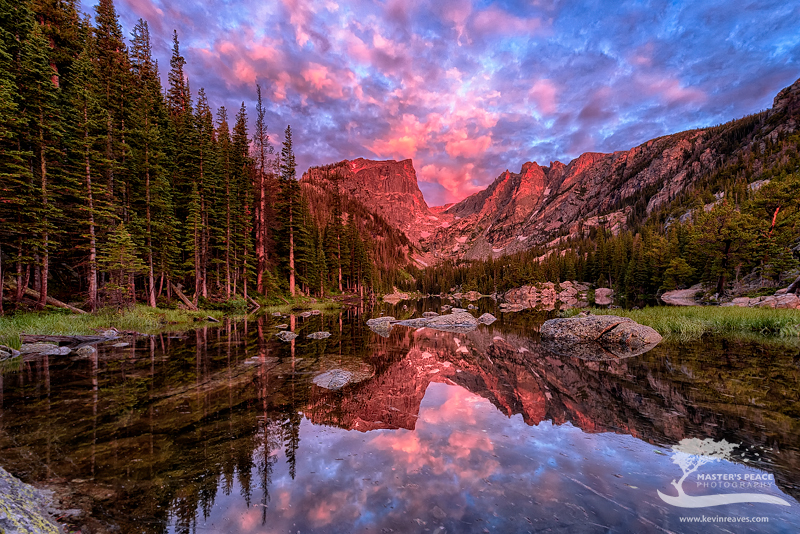 I have been to RMNP many times before, but mostly in the Fall when the skies tend to be blue and cloudless. So, needless to say, I have had my share of dissappointing images from here, but this morning would be different. I knew when I awoke and looked out the window, that the East was clear with scattered cloud cover in the West with an approaching storm that was scheduled to hit around lunch that day and stick around for the next couple of days. To our suprise, we had the place all to ourselves that morning as we witnessed one of the best sunrises I have seen in RMNP over Dream Lake. Photo © copyright by Kevin Reaves.